This Data Protection Policy serves to inform you on how RSVP ProGuide Pte Ltd (“PROGUIDE”) manages Personal Data which is subject to the Singapore Personal Data Protection Act (No. 26 of 2012) (“the Act”). Please read this document so that you know and understand the purposes for which we collect, use and disclose your Personal Data. By interacting with us, submitting information to us, or signing up for any products or services offered by us, you agree and consent to PROGUIDE and its respective representatives and/or agents (“Representatives”) (the Company and Representatives collectively referred to herein as “PROGUIDE”, “us”, “we” or “our”) collecting, using, disclosing and sharing amongst themselves your Personal Data, and disclosing such Personal Data to the Companies’ authorised service providers and relevant third parties in the manner set forth in this Data Protection Policy. This Data Protection Policy applies across all platforms used by ProGuide in the conduct for our businesses, including, but not limited to, our website, our enterprises management systems (such as our email marketing system, training management system and learning management system), and all other communication means and touchpoints. This policy supplements and does not supersede nor replace any other consents you may have previously provided to PROGUIDE in respect of your Personal Data. PROGUIDE may from time to time update this Data Protection Policy to ensure that this Data Protection Policy is current. Subject to your rights at law, you agree to the prevailing terms of this Data Protection Policy as updated from time to time on our website www.proguide.com.sg/pdpa. Please check back regularly for updated information on the handling of your Personal Data on our website. Examples of such Personal Data you may provide to us your name, NRIC or other identification number, telephone number(s), mailing address, email address, academic and employment records, personal lifestyle data and any other information which you have provided us in any forms you may have submitted to us. If you provide us with any Personal Data relating to a third party (g. information on your customers, spouse, children, parents, and/or employees), by submitting such information to us, you represent to us that you have obtained the consent of such third party provide us with their Personal Data. These purposes may also apply even if you do not maintain any account(s) with us, or have terminated these account(s). If you are an employee of ProGuide, or an employee, business partner, sole proprietor, investor , proxy voter, corporate shareholder, guardian, director, nominee director or guarantor, agent or representative of an organisation that has a business relationship with PROGUIDE. When you interact with us on our websites, we automatically receive and record information on our server logs from your browser. PROGUIDE will take reasonable efforts to protect Personal Data in our possession or our control by making reasonable security arrangements to prevent unauthorised access, collection, use, disclosure, copying, modification, disposal or similar risk However, we cannot completely guarantee the security of any Personal Data we may have collected from or about you, or that for example no harmful code will enter our website (for example viruses, bugs, trojan horses, spyware or adware). You should be aware of the risks associated with using websites and any of our technology-enabled management systems. While we strive to protect your Personal Data, we cannot ensure the security of the information you transmit to us via platforms not managed by ProGui We urge you to take every precaution to protect your Personal Data when you use such platforms. If applicable, you undertake to keep your username and password secure and confidential and shall not disclose or permit it to be disclosed to any unauthorised person, and to inform us as soon as reasonably practicable if you know or suspect that someone else knows your username and password or believe the confidentiality of your username and password has been lost, stolen or compromised in any way or that actual or possible unauthorised transactions have taken pl We are not liable for any damages resulting from any security breaches, on unauthorised and/or fraudulent use of your username and password. Write to: Data Protection Officer, RSVP Proguide Pte Ltd, 9 Bishan Place, #09-03, Junction 8 (Office Tower), Singapore 579837. Please note that if your Personal Data has been provided to us by a third party (e.g. your employer) you should contact such party directly to make any queries, feedback, and access and correction requests to PROGUIDE on your behalf. If you withdraw your consent to any or all use of your Personal Data, PROGUIDE may not be in a position to continue to provide its products or services to you or administer any contractual relationship already in pl This may also result in the termination of any agreements you have with PROGUIDE, and your being in breach of your contractual obligations or undertakings. PROGUIDE’s legal rights and remedies in such event are expressly reserved. This Data Protection Policy and your use of our website and/or our enterprise management systems shall be governed in all respects by the laws of Singapore. ProGuide is a social enterprise wholly owned by RSVP Singapore - The Organisation of Senior Volunteers, a non-profit Organization. It conducts business consultancy and training to generate revenue to support its parent charity's programmes. 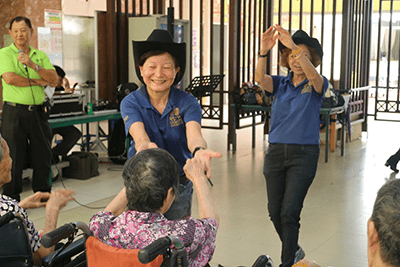 RSVP Singapore is a non-profit organisation dedicated to empowering senior volunteers in making a difference for the less privileged in the society. Through impactful community service programmes, the organisation serves more than 150,000 beneficiaries each year.